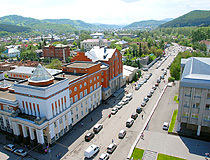 The capital city of Altay republic. 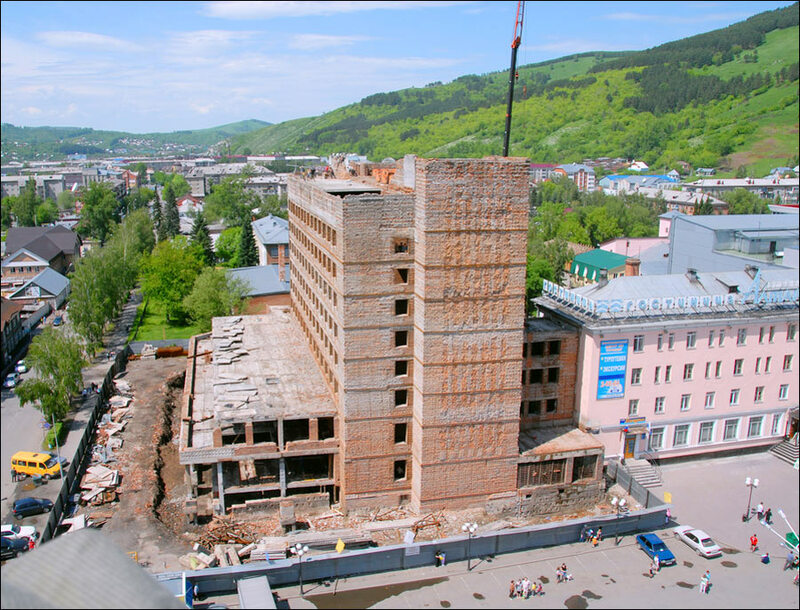 Gorno-Altaisk or Gorno-Altaysk is a city located in the south of Western Siberia, the capital of the Altay Republic, Russia. 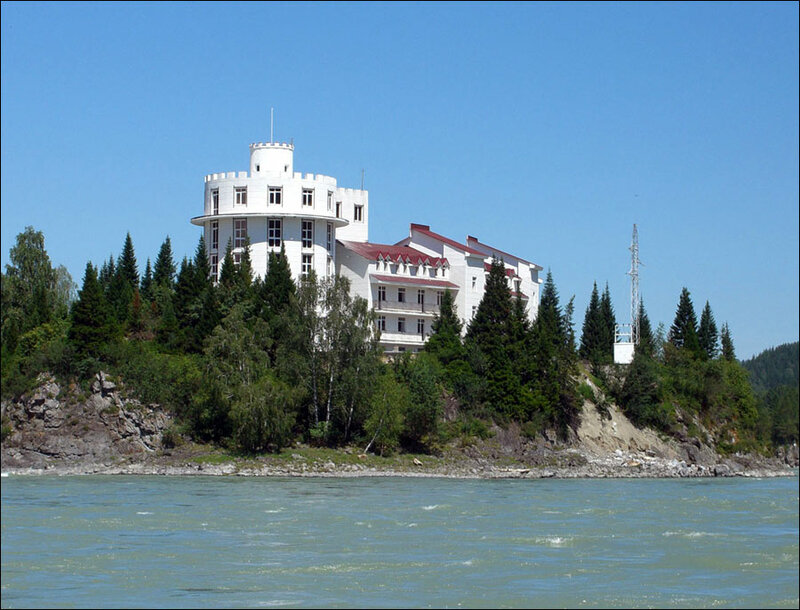 It is situated in the northwestern part of the republic, about 3,640 km from Moscow. 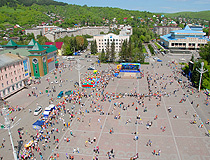 The population of Gorno-Altaisk is about 62,300 (2015), the area - 95.5 sq. km. The phone code - +7 38822, the postal codes - 649000-649007. Local time in Gorno-Altaisk city is April 21, 2:15 am (+7 UTC). 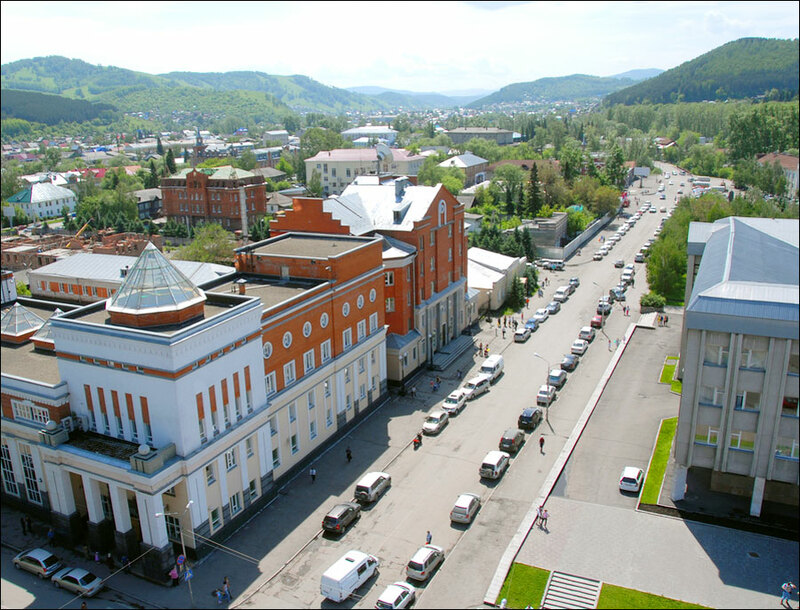 The city’s history dates back to the beginning of the 19th century, when, on the place of present Gorno-Altaisk, there was a small settlement of Teleuts people. In 1824, the first Russian settlers moved here from Biysk, and founded the village of Ulala. Its continued development was closely linked with the work of the Altai Spiritual Mission. In 1831, Ulala village was chosen to be the center of the Orthodox mission in the Altai region of the Russian Empire. 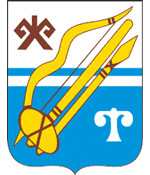 Later, some Biysk merchants moved to Ulala. After a few decades, Ulala became a major trading center of Biysk county, Tomsk province. After the Russian Civil War, Oirot Autonomous Region was formed. 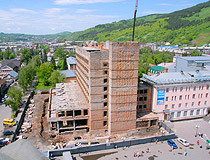 In 1922, the village of Ulala received the status of the administrative center of the region. Six years later it was transformed into the town. In the next two decades, Ulala changed its name twice. In 1932, the town was renamed to Oirot-Tura, and, in 1948, on the basis of a memorandum of Altai historian and ethnographer L. P. Potapov sent to Stalin, Oirot Autonomous Region was renamed Gorno-Altaisk region, Oirot-Tura was renamed to Gorno-Altaisk. An important event in the local history was unexpected and accidental discovery made by the archaeologist A. P. Okladnikov on July 5, 1961. On the left bank of the Ulalushka River, while walking on the slopes of the mountains surrounding the city, he found stone tools. The excavations held here in 1976 and 1981 allowed to find antiquities which were about 150-200 thousand years old. Before that, the earliest known remains of human activity in Siberia were the age of 21,000 years. 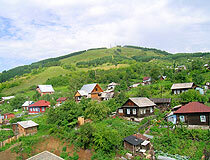 Until 2010, Gorno-Altaisk had the status of historical settlement. 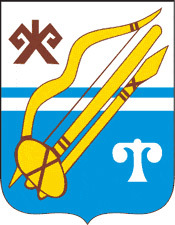 Gorno-Altaisk is the only city of the region. It lies in Mayma valley, at the foothills of the Altai mountains. 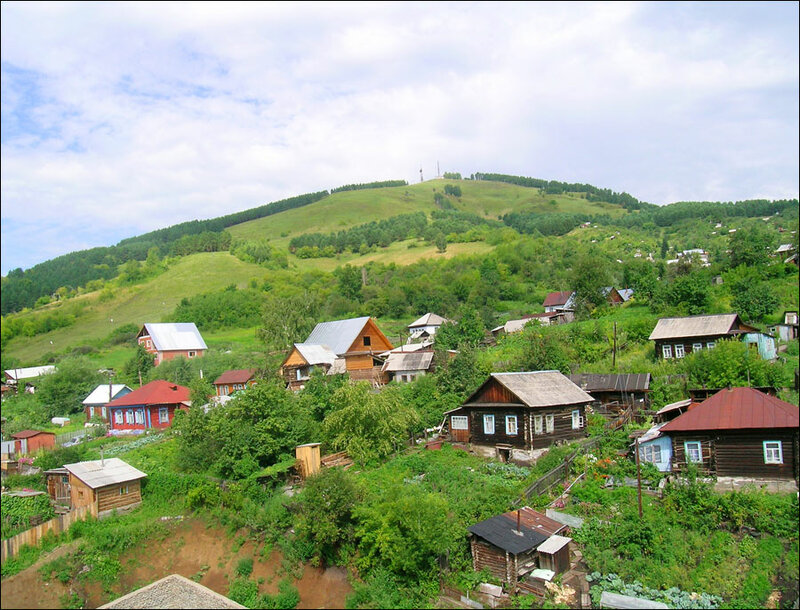 The city is located in the forest-steppe zone, where open steppe spaces are interspersed with birch and pine forests, covering mainly the northern slopes of the valley. The nearest railway station is located about 96 km away in the city of Biysk. The climate is sharply continental with hot summers and cold winters with thaws. The average temperature in January is minus 15 degrees Celsius, in July - plus 18 degrees C.
In November 2011, after a long reconstruction, Gorno-Altaisk airport was opened. It makes the city more accessible to tourists and vacationers. Flights to/from Moscow, Novosibirsk and Krasnoyarsk are available. The city has about 30 hotels and more than a dozen companies in the field of tourism services. 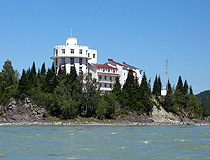 The National Museum of the Republic of Altai named after A. V. Anokhin (Choros-Gurkina Street, 46) has the mummy of the Altai princess from Ukok plateau. Gorno-Altaisk has three Orthodox churches, a mosque with a madrassa and a Buddhist datsan. If you are a guest of Gorno-Altaisk, you will definitely want to buy some souvenirs. It is not a problem, the city has a number of souvenir shops. The Center of Crafts “Enchi” offers national jewelry made of stone, wood and leather, felt accessories, paintings made by local artists, etc. The center also plays a role of an exhibition hall. Here you can learn more about local arts and crafts, lifestyle and national clothes of people living in the Altai Mountains. In addition, you can make original photos in national clothes (Choros-Gurkin Street, 38). “Masters of Altai” is a network of souvenir shops located throughout the city that sells souvenirs made of wood, original birch magnets, fur charms with natural stones, figurines made of marble chips, etc. Addresses: Kommunisticheskiy Avenue, 60 (the shopping center “Real”), Chaptynov Street, 24 (the Government of the Republic of Altay), Palkin Street, 1 (the State Assembly), Kommunisticheskiy Avenue, 16 (the Drama Theater). “Kan Altai” shop offers handmade Altai charms and souvenirs. Here you can buy interesting items made of cedar, paintings, ceramic mugs with Altai names, etc. (Kommunisticheskiy Avenue, 11 (the shopping center “Maria-RA”). “Souvenirs of the Altai Mountains” - a wide range of magnets, T-shirts, beads of semi-precious stone, original mirrors. Address: Kommunisticheskiy Avenue, 53 (the shopping center “Tourist”), Kommunisticheskiy Avenue, 109 (the shopping center “Gorniy”). 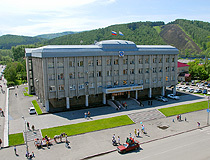 The City Tourist Information Center of Gorno-Altaisk provides free information about the customs of the locals, religious rites, shrines, protected natural, cultural and historical areas, tourist facilities, as well as other information related to the organization of recreation and tourism in Gorno-Altaisk and the Republic of Altay. Call-center 8 91369 40004 (around the clock), Kommunisticheskiy Avenue, 5/1, room #37.